The past few months have been difficult for our family, with the passing of my dad on September 3. While my brother and sister and I are naturally very sad, it is our mom Elaine who has had the toughest adjustment. Mom and dad did a lot of fun activities together, but Broadway-style musicals were not on his wish list. So when I heard that Mary Poppins the Musical was Montreal-bound I told mom I would try and get tickets. "When you were kids, I had the L.P. that I played for you all the time," mom said. "When you were a little boy, daddy and I took you to the movie and you were fascinated when Mary Poppin flew on her umbrella. After that I read you the storybook and daddy brought home the record .I remember the old LPs. We had a wonderful collection, but unfortunately we got rid of them because they went out of style like the horse and buggy." The show was spectacular from beginning to end. While young children will naturally enjoy it, this was by no means a "kids" show. It tells the tale of the Banks family, who live in a big house in London on Cherry Lane. Kids Jane and Michael are out of control and in need of a new nanny. Suddenly, a mysterious young lady named Mary Poppins arrives at their doorstep, weaves a little magic and changes everything for the better. Now I must say, Mary's job interview was very brief. There was no resume or references submitted. She was hired on the spot. The kids were glued to her immediately as out of her magical suitcase came a tall coat hanger, a clock and a few other items. The cast was magnificent. Madeline Trumble as Mary had me thinking Julie Andrews right from the start while Con O'Shea-Creal as Bert had a little Van Dyck in him. Micheal Dean Morgan and Elizabeth Broadhurst were just dandy as Mr. and Mrs. Banks, but it was the two child actors who totally stole the show. There are four youngsters rotating the roles. Julianna Rigoglioso and Eli Tokash were on stage for the presentation we saw. Besides being absolutely adorable, their singing, acting and dancing was at a very high level. This was a truly polished shows, with one of the most magnificent sets for a travelling production I have seen in some time. There was the amazing pop up house, the rooftops, the park and the very believable raindrops. Mary did indeed fly and Bert climbed the walls and danced upside down. I looked around at the audience and everyone just had big smiles on their faces. The songs were amazing and mostly familiar: Chim Chim Cher-ee, Cherry Tree Lane,The Perfect Nanny, Practically Perfect, Jolly Holiday, A Spoonful of Sugar, Feed the Birds, Supercalifragilisticexpidalidocious and more. I have them all humming in my head. At the end of the show, Michael Dean Morgan announced that the cast was raising money for a number of charities, including to assist victims of Hurricane Sunday. Audience members were invited to drop some cash in buckets on the way out, purchase some special merchandise or for $250 get a back stage tour. Oh yes, and mom went home on cloud nine! She loved every minute of the show. 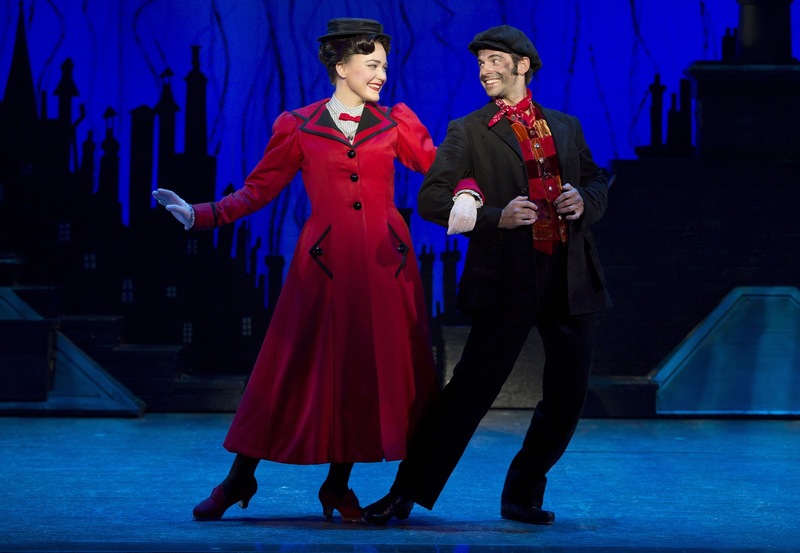 For more information on how to get tickets go to evenko.ca or marypoppins.com. Thank you Evenko and Broadway Across Canada for bringing such a top quality musical to Montreal. Next on the horizon is Billy Elliott, January 8 to 13, 2013, also at the Place des Arts.